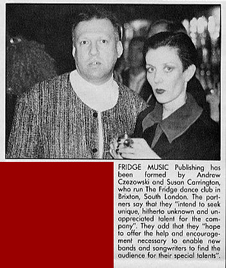 Matt Newbury meets Susan Carrington & Andrew Czezowski, raconteurs, clubland aristocracy, originators of Love Muscle and owners of legendary venue The Fridge... "I was managing Generation X then in the guise of Chelsea with Billy Idol on guitar and a guy called Gene October on vocals" begins Fridge supremo Andrew Czezowski. "Gene told us about a club called Chagurama, which must have been one of the first gay clubs back in the mid 1970s." "The venue was all mirrors and velvet seats and candles. Gene convinced them that the band should play there on a night they don’t normally open. By the time the gig was about to come about, the venue had gone broke, changed its name to The Roxy, we’d got rid of Gene and put Billy on vocals and had new guitarists. They were now called Generation X and we had a full house, which was only 180 people, but still amazing." Andrew and partner Susan ended up running the seminal punk venue for just 100 days, but during that time it achieved legendary status as the punk venue of choice, frequented by the likes of The Clash, The Police, Siouxsie Sioux and Chrissie Hynde. If you’re looking for more anecdotes about these days that unfortunately space does not permit here, perhaps ask Andrew the one about Billy Idol and Sid Vicious having a fight with a quiche! The twosome certainly helped get the punk scene kicking - indeed, they were punks themselves at the time, and helped provide some legitimate exposure for many of the up-and-coming bands. "We opened the first Fridge back in 1981 at The Ram Jam," continues Susan. "It’s actually the club we’d started dating in back in 1966, back in the days when Otis Reading and Ike & Tina Turner were playing there, so it seemed ideal. We started a gay night called Oven. We were dressed as punks with spiky hair, and found ourselves welcomed in gay clubs, where we could have a laugh. We were the cabaret, a couple of punks in a room full of serious old queens. We went to things like Bang and a secret gay club called Mandy’s while loads of our staff were gay, including our manager. We also met Yvette with her group Alternative Happenings, who were neo-naturalists with painted bodies doing strange dances and having pink painted poodles on the stage and all sorts of strange stuff. All very Frankie Goes To Hollywood." It certainly wasn’t all plain sailing. The year the pair opened the mini-Fridge was the worst winter in 15 years. The Eurythmics played to an audience of ten people, reducing Annie Lennox to tears. Five months later, the Brixton Riots broke out and the banks withdrew their support. Then, the current venue opened in 1985 when the old ACE Cinema closed down up the road, and Andrew borrowed £5,000 in cash from his old friend Joe Strummer, given to him in a plastic bag in a pub! The duo behind one of Brixton’s most successful night spots have been selected as finalists in the business category of the Londoners of the Year awards.The pair were nominated for their efforts at The Fridge Nightclub, which they set up in the 1980’s and the Fridge Bar. They are the first people nominated for the awards from a venue supporting gay promotions. The pair have turned The Fridge into one of Brixton’s biggest attractions. It has grown to the extent that they provide employment directly and indirectly for more than 150 people. Carrington and Czezowski have also made a huge contribution to the Brixton community. They are active in fund-raising for charities and voluntary organisations and are heavily involved with VIBE, a Brixton community group, and gay charities which raise money at The Fridge’s popular Love Muscle nights on Saturday. The ceremony for the London Chamber of Commerce-sponsored awards will be held at the Roof Gardens in Kensington. The Fridge is more than a club, it’s an institution. Jane Alexander reports on London’s ultimate social melting pot. This is a tale of love, passion and night clubbing. A story of success and disappointment, of star-studded parties and a lonely prison cell. It has a cast of millions, with guest appearances from Eartha Kitt, Amanda Lear and The Eurythmics. Next week it’s leading man, Andrew Czezowski, comes out of HM Prison Ford - where he has been detained for the past six months - to return to centre-stage and his leading lady, Susan Carrington. Its true star, however, is a building: The Fridge. 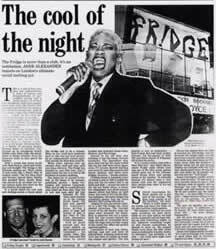 The Fridge is one of the longest running independent night-clubs in London. To attend The Fridge is to be cool; to enter it is to enter an oven. On the best nights there is scarcely a dry brow in the house. The dance floor is a frenzy of gyrating bodies, dressed down in minimal chic, dressed up in outrageous kitsch. Unlike some other clubs, the atmosphere is always friendly. Even the bouncers smile as they patrol the borders. With a crowd that mixes locals with West Enders, black and white, gay and straight, The Fridge is the ultimate melting pot. Their roster of acts reads like a Who’s Who of modern music. The Pet Shop Boys and Erasure played there; Eartha Kitt growled there, Sandie Shaw was scared to go on stage and Annie Lennox burst into tears on the Eurythmics’ first gig there. In a world where the cool rule and chilling counts, a venue called The Fridge had to be a winner. What no one could have predicted back in 1981 was just how successful an independently owned nightclub outside the West End could be. While other niteries rose up, strutted their stuff and then sank into disco oblivion, The Fridge has boogied on, year after year. And 11 years down the line it is still at the forefront of London clubbing. The reason for its success is two fold, in the shape of its creators, guardians, parents - Susan Carrington and Andrew Czezowski. They met in 1966 in a small Brixton club called the Ram Jam. They fell in love and soon after fell into business. By 1976, when punk snarled on to the London music scene, the pair had opened the legendary Roxy, giving a place to pogo and licence to gob to the likes of The Clash, Generation X and X-Ray Spex. And as punk passed and the scene shifted, so did Carrington and Czezowski - via classic clubs like Two Tone and Hell back to South London and Andrew’s home town, Brixton, and The Fridge. "There’s no reason not to succeed if you have the imagination, along with the determination to make something happen. Money is almost irrelevant, but it helps"
Exploring the listings of London’s nightlife, it soon becomes obvious that the hippest of one night stands has serious logistics problems - they’ve mostly got the same address. The sad truth is that, like any other town, there are only so many suitably sized venues. So, West End clubbers trying several venues in one week could find themselves becoming a regular at Busby’s in Charing Cross Road. The music may vary and the temporary decor may peel off, but basically it’s the same old shell for the Mud Club, Do-Do’s, Jungle and a hundred other occasional legends which have passed through its doors. Clubs in London aren’t visually pronounced, like, say the Hacienda in Manchester... Except for The Fridge, that is, nestling in Brixton, South London. The Fridge is without doubt the most visually aware and totally conceived venue in the capital, and probably Britain - even though the aforementioned Hacienda may balk at such a suggestion - but have they looked recently? The Fridge never stands still. Its location alone has meant that they’ve had to virtually fight for every customer - and fight again to keep them coming back - and the fact that people do is proof alone that something special is happening. The Fridge isn’t a poky little cellar, it’s a former cinema, converted after a fire almost four years ago. On the outside there are five fridges suspended above the door, while inside there are dozens of TV screens set in a mass of scaffolding and intricate architectural arrangements. Every space is crammed with screens and yet more hang from the, still burnt, ceiling, and as many as 14 go-go dancers gyrate around the sides, while the stage is always a masterfully arranged set piece - everything is on the move. Not for the Fridge the millions of pounds of lighting of the bigger dance floors, but still the effect is truly spectacular. The forces behind the whole concept are Andrew Czezowski and Susan Carrington. Their story goes back to the ‘60’s, but they first come to prominence when they put on those original nights at the Roxy club during the outbreak of punk in the late ‘76/early ‘77. But the duo didn’t own the club and, once ousted by the freeholder, the club soon folded. The bug had bit and the original plans for a club of their own were hatched in Brixton. But that small, compact establishment didn’t last long and Andrew and Susan found themselves without funds and without a venue. Surprisingly they took on the old Ace cinema in Brixton - a venue six times bigger - and the new Fridge was launched with a lot of work and the minimum of financial support. "We’ve had to build it up with the money taken at the door and survive on good will from our workers and suppliers. It’s been hand to mouth for four years" recalls Andrew. But their enthusiasm for youth culture and the enthusiasm it breeds allowed them to give The Fridge a look and reputation that money can’t buy. The staff they employ are similar thinkers, energetic and honest, and that’s reflected in the clientele that the club attracts. Naturally the club manager is a 26 year old girl and the door man, Ivan is, inevitably, dressed as a woman. "You don’t need money as much as you need energy. Sure, if I had access to money I could have condensed the last three years’ work into six months - but we got there, and it’s been exciting for people to have experienced the changes through our history. We opened in the shell of an old cinema because we had to, but we knew from the very start that we were going for a complete visual experience rather than a simple aural disco one. What we’ve developed here is the next five to 10 years of the club business, but by then me and Susan will probably be into something else. We won’t have the energy for youth forever, and if we can’t do it justice, we won’t cling on." The images created for The Fridge are put together by a team of five people who work exclusively for the club, so you won’t see these interiors anywhere else. Andrew has also bought exclusive rights to the Stakker (of Stakker Humanoid) videos for the next six months, by which time they’ll have enough of their own to show. "We started with a truckload of old tv’s because we preferred the idea of cracked images to quality equipment, it added an interesting, uncontrollable dimension. On top of that we’ve gradually added all sorts of movie formats and dozens of slide projectors - it now takes around 1,500 slides a night to create the whole environment, but as always it’s ideas that are invaluable, not equipment." And more ideas and images are set to follow. Susan and Andrew celebrate the new year by buying the freehold of the building and March sees the birth of a record label and music publishing house. If you can’t get down to the Fridge, and you really should try, then maybe you can hear the kind of things they’ll be playing in the coming months. Look out for it....they’ve only just begun.